Baby bedtimes are varied and hard to pinpoint at first. The joy of having a new baby comes with so much contentment and joy, but it can also come with new territory of finding a new rhythm as a family. What is the best time for the baby to go to bed? How do you create a baby bedtime routine? How do you make sure to take care of yourself, too, as a mom? I remember the first time I came home with my baby. My husband and I felt so protective and unsure as we gave our tiny little human his first bath. I learned within the first few weeks my way of life was going to change forever. We were creating a new rhythm of life. One thing to keep in mind is you can establish a bath time routine with your baby to help include in a bedtime routine as well. It is typically around 6-8 weeks you can start to have a pretty well established routine with your little one. I have always agreed with the Wake, Eat, Play, Sleep approach to establish a wake and sleep pattern. (I have written about this before in my baby guides and LOVE the Book On Becoming Babywise.) By establishing this kind of pattern your child isn’t reliant upon being fed to fall asleep. I try to sneak one more feeding time in before I go to bed for the chance I will get more sleep and establish a longer sleep time for the baby. I do not wake a sleeping baby to feed unless it is in the middle of the day and the baby is still working out the difference between day/night. Creating a signal of the beginning of bedtime is a great way to help your baby/child understand it is time to transition to sleeping. This could be with dimming the lights, singing a favorite song, taking a bath, changing the diaper, or reading a special book. If you have a fussy baby and you are trying to establish a bed time routine to increase sleepiness baths every night can be helpful. 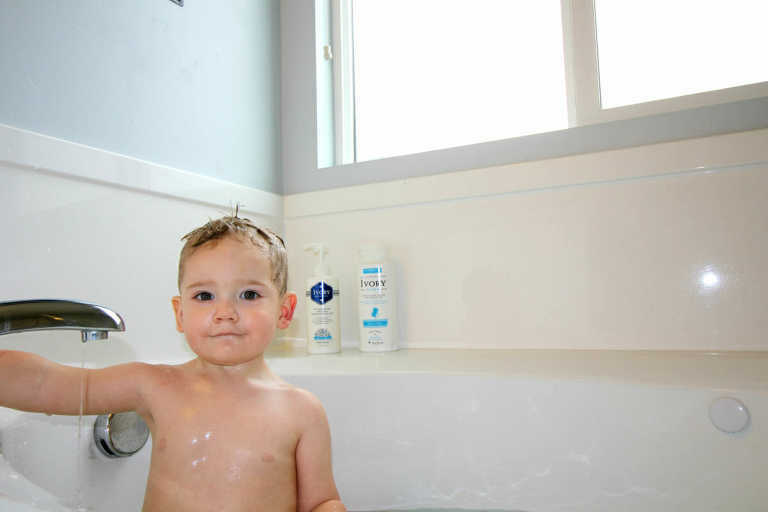 Remember your baby’s skin is more likely to dry out so it is important you are not using soap for every bath and you make sure to moisturize their skin. Baths are a great tool with helping babies to sleep. I like to use cleaners and soaps gentle enough for anyone in the family. I really love the pure formula of Ivory. 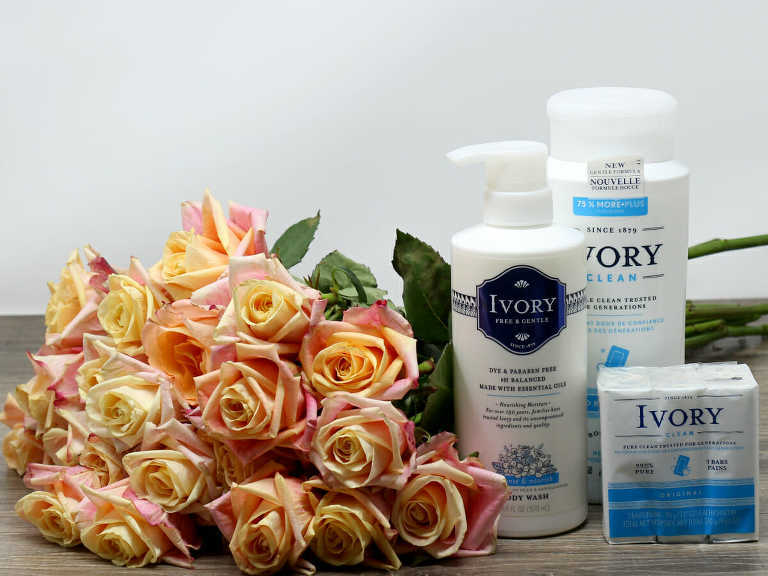 Ivory has created soap which is 99.44 percent pure for 138 years and is dedicated to providing products with thoughtful ingredients that families trust. As my baby gets a little older I will even get in the bath with him/her and have special bonding time in the warm water. It is nice to use a soap that is gentle on baby and mom’s skin like Ivory’s pure and gentle formula trusted for generations. It’s even known as “The Original Gentle Family Brand.” The products have darling, new packaging, and remains the family trusted brand we all know and love. The products I tested include Ivory Original 3-bar, Ivory Original Body Wash and Ivory Free & Gentle Body Wash with Pear & Sandalwood. *Bonus tip: throwing your baby’s PJ’s or wrap in the dryer before putting them on can help with inducing that warm, sleep effect too if you are in a time crunch or you want to give a double whammy in sleepy inducing. Find a routine that allows you to take care of your needs, too. For me, especially in the beginning, I find it hard to take time for myself. When your baby is napping during the day or you have someone you trust watching him/her, make sure you are taking time to shower, too. This sounds so silly, because maybe you don’t need the reminder, but for me I always seem to put it off for too long as I tend to my children’s needs. By the time I take my shower it feels like a spa treatment because it revitalizes my senses so much. Use a soap that makes you feel refreshed and rejuvenated. I love the Ivory Free & Gentle Body Wash with Pear & Sandalwood as it contains the #1 Dermatologist-Recommended moisturizing ingredient. It is the perfect step up from the baby scent and cleans even better. This product comes with an easy to access pump and that makes it so much easier to use! The Original 3-bar is the same pure soap formula free of dyes and heavy perfumes. This is great for travel or for those who prefer bar soap to liquid. The Ivory Original Body Wash has a new, gentle formula also free of dyes and heavy perfumes. The Ivory Free & Gentle Body Wash with Pear & Sandalwood is my favorite. You still get the same wonderful clean effect with a twist of fabulous flavor that is light and smells so good. Gentle enough for you and your whole family for simple, easy bedtime routines. Now that my baby is older, and we are on a routine which fits his schedule and sometimes includes morning baths when his older siblings are at school and he gets to enjoy the bath all to himself. I hope these tips helped you find a routine that works for you!